Home » DECORATING IDEAS » 35 Dollar Store Home Decor Ideas Jazzing up Even the Simplest of Store Finds! When someone mentions home decor, it often calls for spending thousands of dollars to get that welcoming and gorgeous vibe to the space. But is there anyone who wouldn’t want leave an impressive mark on all their guests with a gloriously decorated house? Head to the Dollar Store to grab some of the most simple items that you can transform into mesmerising pieces of craft, whether it’s lovely vases, pretty shelves, statement-making lampshades, centerpieces and much more. Here are 35 Dollar Store home decor ideas to inspire you right away! When it comes to gardening or simply having our favorite flowers around the house, terra cotta pots have proved to be no less than a boon for indoor as well as outdoor planting affairs. 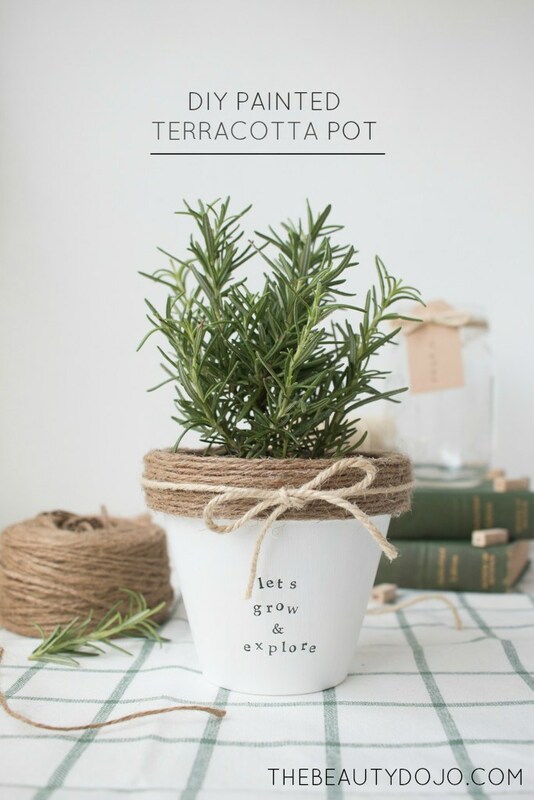 This stunning inspiration combines planting with a touch of color, spruced up with pretty stamped letters that you can use to write a quote or a special message on the pot – perfect to present to a loved one! The pot is coated with white paint and wrapped on the top with a jute twine, finally tying an ivory twine bow. 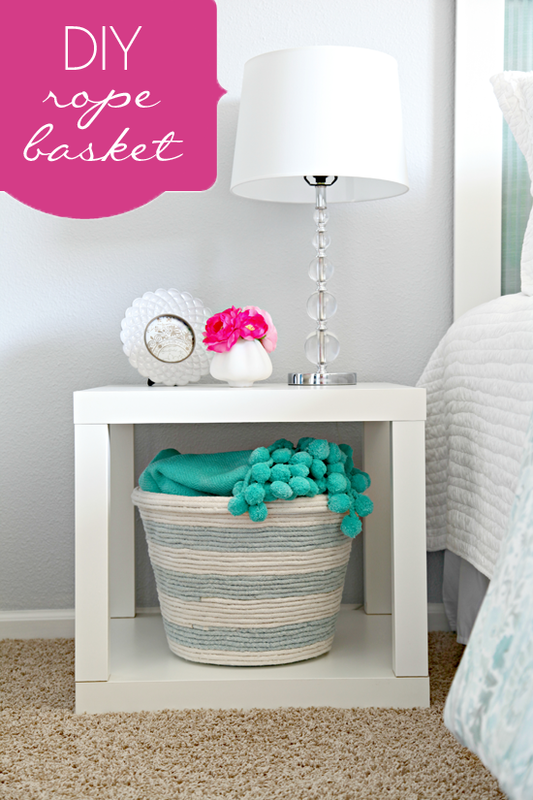 Nautical decor items add a fresh, summery vibe to the space – and that’s why you truly need this DIY rope basket that starts from a readily available Dollar Store plastic basket and gets all jazzed up with different colored ropes that rightly match the color scheme of your decor. The idea is to coat the plastic bucket with spray paint, further adhering rope around it using a hot glue gun until you cover the whole basket. Use it to store the kid’s toys or a bedside storage solution for all those throw blankets, it’s never going to miss the mark! Synonymous to mesmerising are these DIY gold vases adorned with luscious succulents, forming lovely table-top planters. And it’s almost impossible to figure out that they are constructed using mini juice glasses that cost no more than 1 dollar each and are easily available at the Dollar Store. You are also going to need some painter’s tape, newspaper, and gold spray paint to put craft the vases. Securing the outsides of the glass with newspaper, you go for the spray paint on the insides, leaving a shiny exterior on the pretties. If all things rustic is your decor obsession, then these glass candlesticks are going to be music for the soul to you! Worked up as a Dollar Store challenge by Southern Color, this one is a glorious makeover done to glass candlesticks giving all the credits to lovely twine wraps covering them all over. Two candlesticks are joined together to form the larger stand, while going for a single stick yields a smaller version. The top features two stained wooden boards screwed together, having one of them work as a cute message/photo board decorated with a burlap bow while the other one forms the base for the board. Have got an old lampshade that seems to be quite an eyesore and has been lying in that forgotten storage section? It’s time to upcycle it into a farmhouse-inspired masterpiece charmed with delicate yet earthy-looking layers of burlap ruffles. Beginning from the bottom of the shade, you glue the ruffles created by pulling the strings of each burlap strip, advancing to the top in overlapping rows. What you need to put it together is burlap, a pair of scissors and a hot glue gun. The below tutorial shows the steps of construction with lovely pictures explaining the whole process. 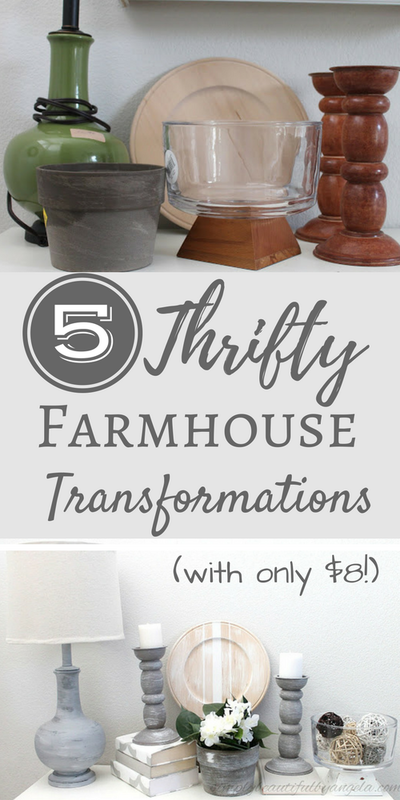 Basic thrift store stuff that most of us would consider as junk at the first sight gets oh so ravishing with just a few little tweaks, and some simple craft supplies. The below inspiration by Simply Beautiful by Angela shows how spending no more than 8 dollars on such finds can give your house some endearing decor objects. You have got a boring lampshade turned into a glorious light-grey prettiness with a distressed paint job, while the shade is covered with a canvas drop cloth. Wooden candlesticks get a pretty chalk-like finish, while a tray is charmed with a grain sack pattern. 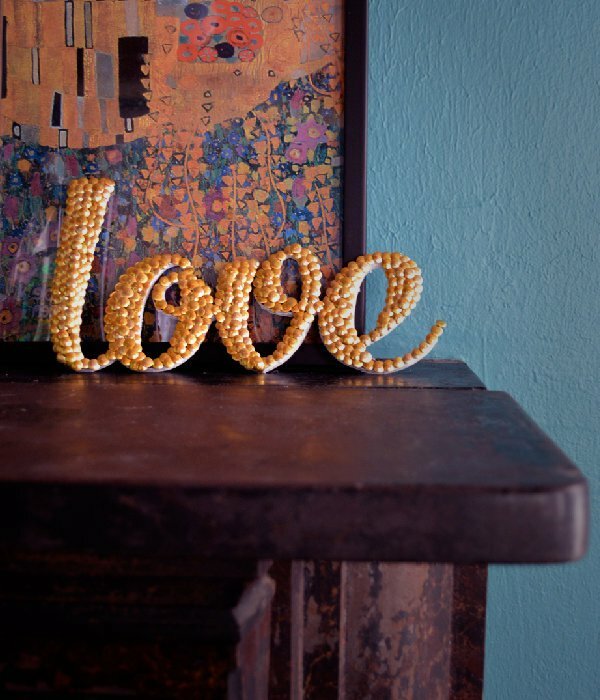 You won’t even need to go for adding a second decor item to your mantel once you have this magnificent letter art resting on it with utmost elegance. Constructed out of loads of golden thumb tacks, this one calls for gathering a foam core board, a gold xacto knife, a spray adhesive and of course, tacks. The secret is to cut out the foam board for the desired word, inserting the thumbtacks into the board starting from the outlines and advancing towards the insides of the letters so that the final output has got an endearing 3 dimensional feel that makes it even more graceful. We bet it’s not going to take more than a nanosecond to madly fall in love with this concrete vase that comes in an adorable buttermilk bottle shape – apt and appropriate for a bedside decor, the dining table or simply the mantel. Plus, that pretty colored band across the bottom of the vase truly complements the natural hue and texture of the concrete. All you need to get started with the project is some Müller Buttermilk bottles, vitamin spray tablets, quartz sand, cement, water, a large container, a spoon, cooking oil, a brush, small sharp scissors , painter crepe, and a sharp knife. Intricate patterns and designs on fabric doilies are absolutely heartwarming, and how delicate they look makes this wall decor inspiration a wonderful addition to the room. What goes into the making of this piece is some different-sized doilies that double up as stencils to paint their designs onto a canvas board. Speaking of the steps, it’s so easy to whip the craft that even the little kids can get it all done without even calling for any assistance. Once you have placed the doilies on the canvas in a random fashion, just grab your choice of spray paint and cover the canvas, lastly, removing the doilies and voila! 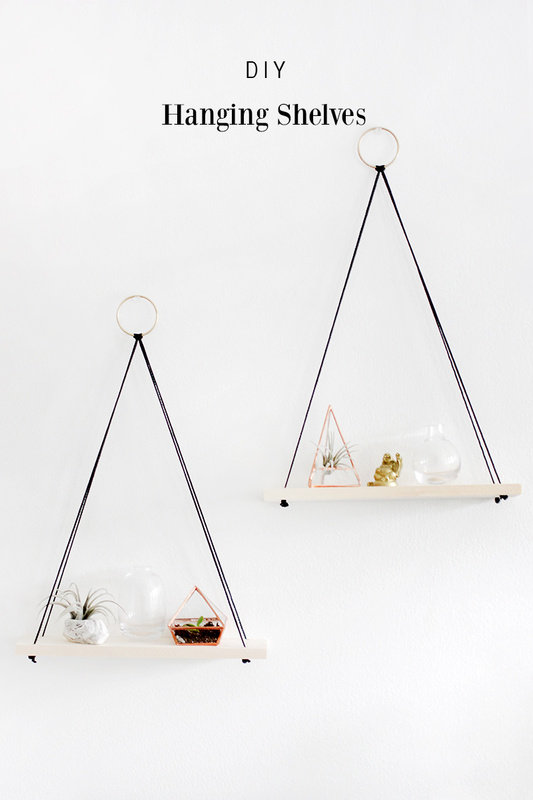 What makes hanging shelves a huge help for small spaces is their ability to utilize the vertical space, that too without sticking to a particular section of the home. These shelves allow you to move from one corner of the house to another as it suits you, using them for different purposes ranging from storage solutions to decoration platforms. The needed supplies include a wooden board, a rope cord, some metal rings that hang the shelves on the nail, a pair of scissors, a saw, and a drill machine. Check out the below tutorial by Why Don’t You Make Me to learn the steps you need to follow. Sophistication clubbed with cuteness has been rightly personified with some DIY candle holders that have been all crafted out using lightning cement. 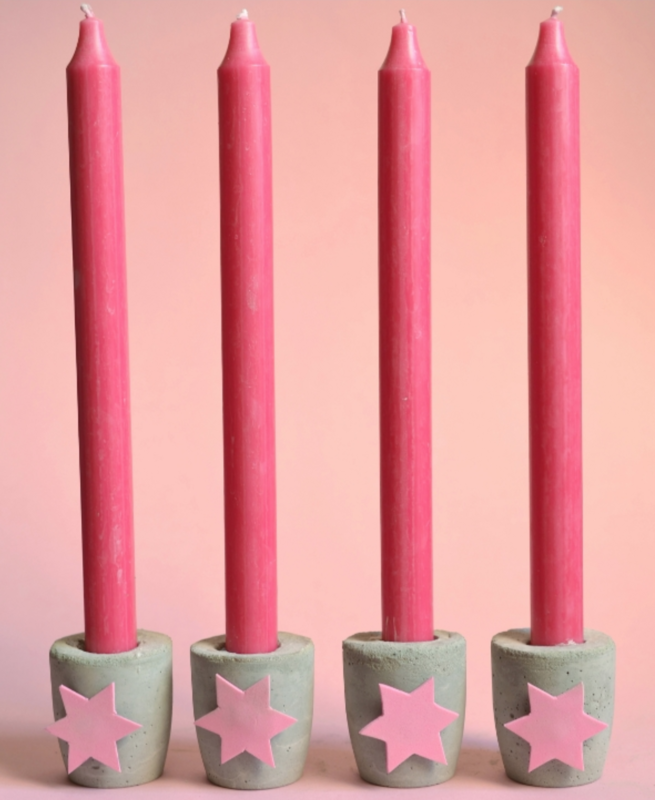 Cute little stars cut out of sponge glued using some double sided tape are the sureshot star part of the holders adding a soothing pop of pastel color to them – you can always splash the dried cement with a coordinating color for an extra charisma. For the molds to pour the cement, the author here uses slightly larger variants of fruit dwarfs. Replace stars with letters, hearts or any shape that appeals you and voila! Doesn’t a picture frame deserve to be as enchanting as the picture it holds inside, making your precious memories even more precious? That’s exactly what this paint dipped frame does with its golden hues and a luxurious-looking white coming together. Masking comes to play for the interesting paint job on this frame – you tape a certain section and apply gold spray paint on the remaining. Once it’s dry, tape the already-painted section and paint again with Fusion’s Lamp white paint. For a deeper insight into the process, head to the below tutorial shared by Brooklyn n Berry Designs. An enticing display for your lovely plants without calling for much space in the room, this DIY vertical plant hanger is a one-of-a-kind farmhouse-themed creation. Putting a few supplies, including a piece of scrap wood, terra cotta pots, your choice of plants, a rope, a metal ring, a drill and bit, a jigsaw, some sandpaper, and some paint or stain to amazing use, the project has two variants for placing the plants. One is to place the pot on a saucer adhered to the wooden board, while the other inserts the pot in a right-fitting hole made in the middle of the board. Those beautifully reflecting mirror trays are something that sound to be a hundred dollar affair to purchase – but what if only a bunch of easily available items when assembled together can help you build a more than gorgeous mirror tray with a luxurious feel? Placing a mirror cut to fit the size of a wooden tray on its surface, further adhering smaller square mirror pieces along the sides of the tray is all it takes to work the goodness up. Apart from this wonderful method, Las Belas shared another way to whip the tray up which is worth checking out right now. It doesn’t need any explanation how mason jars work wonders for crafting DIY lights and luminaries at home. But these hanging lights sporting the delicate part of a glass luminary and the rusticness of a jute rope is not something common to find. What all you are going to need to work the lights up is a long piece of rope, mason jars, some plug in light fixtures with a 25w bulb, a clear-drying super glue, and a skewer. The upper half of the glass jar is beautifully wrapped with rope, leaving the other half exposing the pretty glass surface with all its shine.